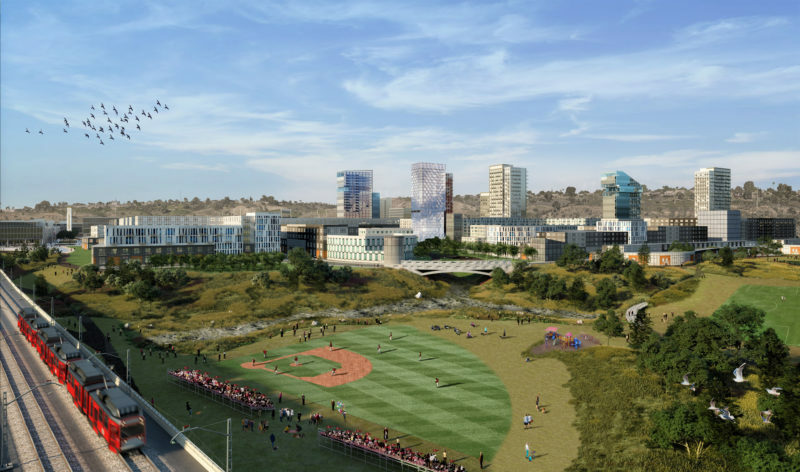 So far, San Diego State University has spent about $1.6 million crafting its vision for the old Qualcomm Stadium site. Documents released by the university in response to a public records request by Voice of San Diego drive home just how close SDSU came to a legal line that prevents public agencies from urging people to vote for or against a ballot measure. Ry Rivard reports that the university hired a political consultant who would later go on to work for a campaign known as Friends of SDSU that urged voters to approve the land deal. It also paid hundreds of thousands of dollars for architectural renderings that Friends of SDSU used to show what the university would do with the land. Though the records shed light on how the university spent $1.6 million creating the plans, officials will not clarify where the money came from. The university is also continuing to withhold some records related to its pre-election planning. VOSD is suing for those records. Mayor Kevin Faulconer last week created a team to negotiate a deal between the city and the university. That team was supposed to include real estate consultants from Jones Lang LaSalle Americas Inc.
On Wednesday, Faulconer asked the City Council’s budget committee to approve a $500,000 contract for Jones LaSalle. But the committee rejected that plan. One obstacle was committee chairwoman Barbara Bry, who had wanted to be on the city’s negotiating team and questioned why the mayor needed a consultant to help. “This is not that complex,” Bry said, according to the Union-Tribune, referring to the sale of one of the most valuable pieces of land in the city. Bry’s 2020 campaign for mayor is based, in part, on her support for SDSU. But the mayor’s team didn’t want her on the negotiating team and City Attorney Mara Elliott, who sued to block the ballot measure, wrote a memo in January saying the city charter would be undermined if Bry or any other member of the Council was directly involved in negotiations with SDSU. Shortly after Council members decided not to approve the $500,000 contract on Wednesday, Faulconer outfoxed them by using his executive powers to hire Jones LaSalle anyway. He can do that without Council approval as long as he doesn’t spend more than $250,000. A Department of Homeland Security employee leaked NBC 7 disturbing documents that show how the U.S. government has been tracking journalists, advocates and an attorney who covered or were tied to the migrant caravan that arrived in the fall. The documents reveal that the government maintained a secret database of targets, many of whom were pulled into secondary inspection and questioned as they crossed the border, had their SENTRI passes revoked or had alerts placed on their passports. The leak follows several reports of attorneys and journalists who worked with or covered the migrant caravan being flagged or even deported from Mexico because of alerts placed on their passports. The DHS source told NBC 7 that the list of individuals includes 10 journalists – seven of whom are U.S. citizens – an American attorney and 47 people from the U.S. and other countries, labeled as organizers, instigators or their roles “unknown,” including advocates from organizations like Border Angels and Pueblo Sin Fronteras. In addition to flagging the individuals for secondary screenings, the Homeland Security official told NBC 7 that the agents also created dossiers on each person listed. Lawyer: Hueso Bill Will Decimate the Public Records Act. Hueso: Nah. A state bill being pushed by Sen. Ben Hueso and City Attorney Mara Elliott would incentivize government agencies to recklessly deny public records without any consequence and will halt all but the wealthiest from pursuing public records, writes Felix Tinkov, an attorney who represents Voice of San Diego on public record matters. In a new op-ed, he explains some of the ways SB 615 is designed to trip up regular folks. For instance, members of the public wanting to file a lawsuit would be expected to explain upfront why the government refuses to release its records, without being able to see those records first. In an interview with KPBS, Hueso defended the bill by citing a growing number of public records requests and the costs of litigation related to them. But he failed to acknowledge, as Tinkov noted, how often the CPRA saves the public far more money than it costs. Latino organizers in North County have begun strategizing with government officials to make sure every resident gets counted in the 2020 Census. But Jesse Marx reports that convincing everyone it’s in their interest to talk to census takers requires a lot of work. They’ll have to overcome a significant amount of skepticism and one of the best rhetorical tools at their disposal is the possibility of less money flowing to local schools and clinics. On Wednesday, a federal judge in California blocked the Trump administration’s plans to include a citizenship question on the 2020 census. A second lawsuit out of New York is headed to the U.S. Supreme Court in April. The mayor and City Council have been pushing San Diego to accept more development. For years, neighborhood groups had opposed efforts to increase homebuilding in the city, perhaps none more so than Uptown, where the planning group that represents Hillcrest, University Heights, Mission Hills and Bankers Hill successfully lobbied the city to adopt a new community plan – after years of work and millions in city funds – that didn’t increase development in the urban core at all. But it appears the pro-development push isn’t just coming from City Hall. Late Tuesday night, a group of community members running together as a slate – and calling themselves Rise Up Town – won all seven open seats on the planning group’s board, including knocking off longtime chair Leo Wilson, as KPBS reported. The group that didn’t win, calling itself Rescue Hillcrest, alleged that the pro-development faction were sponsored by developers. Planning groups only make recommendations on land use decisions, so the change in itself won’t necessarily revolutionize development in the area. But it will make for different conversations on issues like the Normal Street Promenade, protected bike lanes through the neighborhood and any private development proposals that come along. And it shows yet again how much development conversations in town are changing. Circulate San Diego, a mobility advocacy firm, produced a report this week that found a potential 2020 ballot measure by MTS could bring in roughly $10 billion over 40 years, in hopes of getting elected officials and community groups talking about what transit lines, bus services, road repairs or bike projects they could build with that much money, as KPBS reported Wednesday. That’s actually a shade less than the roughly $13 billion MTS thinks it can raise, according to a forecast a consultant provided to the agency earlier this year. MTS was also polling the public on what they most wanted at that time, though the agency hasn’t released the results of that poll yet. For transportation advocates, the need for such a measure has increased – at least compared to what was publicly known – in the last month, as SANDAG finally acknowledged that it won’t bring in nearly enough money to complete everything it promised voters when they approved a half-cent sales tax extension for transportation projects back in 2004. Sweetwater Union High School District is having another bad week. Chula Vista police accused a former employee of embezzling money, NBC 7 reports. Will Huntsberry reported Friday that the board is planning to cut 30 percent of the central office staff as it deals with its budget crisis. The drama between Reps. Juan Vargas and Alexandria Ocasio-Cortez isn’t over. Vargas is doubling down on his position that questioning U.S. foreign policy is “unacceptable.” In an interview with the Washington Post, Vargas was dismissive of Ocasio-Cortez’s challenge online that he further explain what he’d meant. The Morning Report was written by Ry Rivard and Andrew Keatts, and edited by Sara Libby.